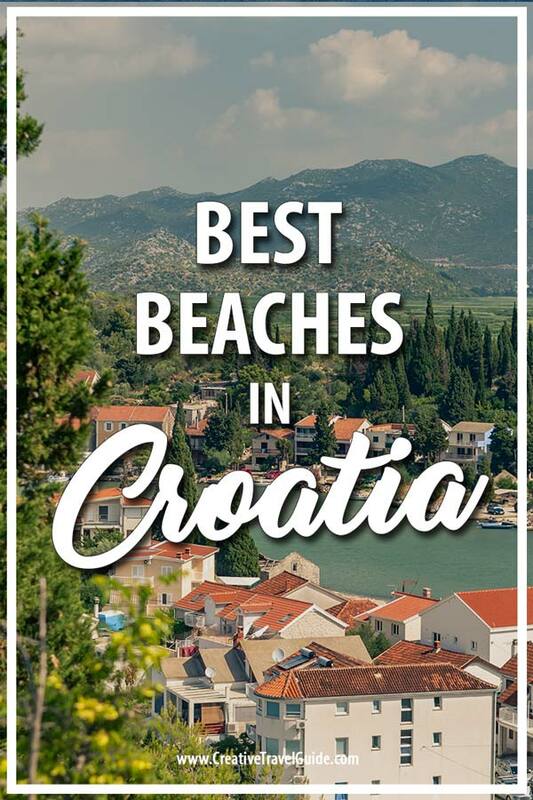 A massive thank you to Anna for her amazing guest post on the best beaches in Croatia – a complete guide to vacationing on the sandy shores! If you’re planning a vacation in Croatia this summer, there are some things you should know before you go. Like where to find some of the best beaches, especially the beautiful sandy ones. There are sandy beaches on both the mainland and on the islands – this post will cover both. I’ll also show you beaches that are far away from the crowds and that are surrounded by pristine nature, as well as beaches where you can party on the sand and make lots of new friends in the process. 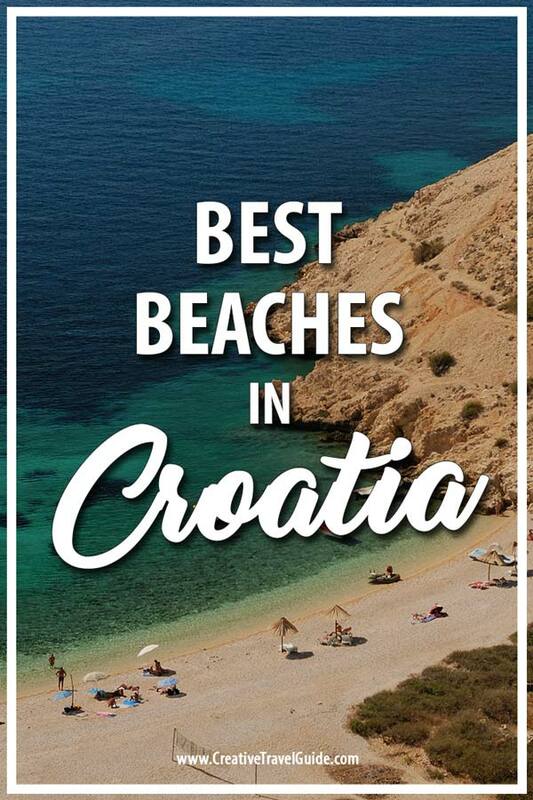 So, whatever your preferred vacation style is, you’ll find some great options in this guide on the best sandy beaches in Croatia! You don’t have to be able to pronounce the name of this beach to find it. It is on the Island of Rab, and it is one of the most beautiful sandy beaches in Croatia, despite not being as popular as those in Hvar. 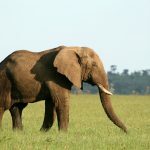 The best thing about it is that it is very secluded – so, don’t expect huge crowds. Which is great for groups of friends who don’t need any additional entertainment other than themselves. Or couples that just want to be away from the crowds. The Čifnata beach doesn’t have any facilities or bars, so be sure to bring enough food and drinks for the day. If that’s your kind of beach day, then you will love it. It is surrounded by untouched nature, with plenty of pine trees that can provide you with shelter from the sun. Since the beach is in a bay, the water is very calm and crystal clear. 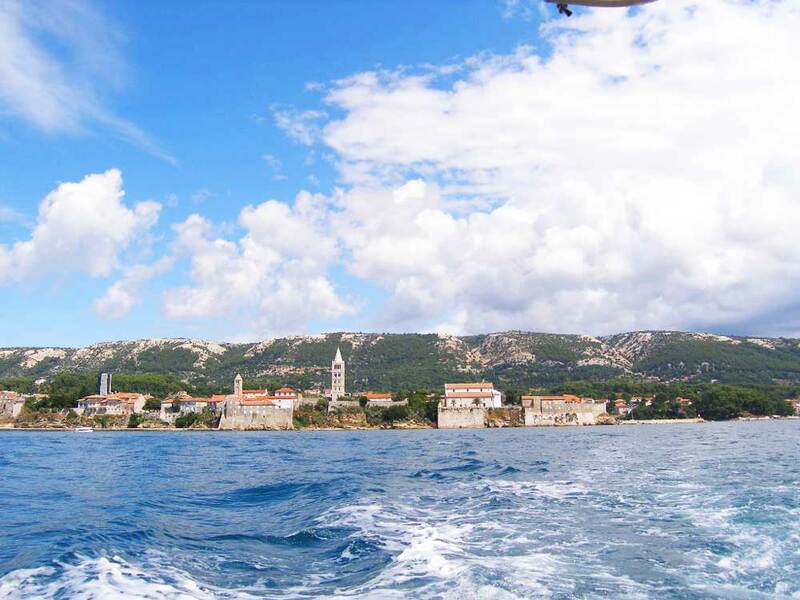 As long as you can get to the Island of Rab, you’ll be able to easily get to the beach. You can either hike there or drive. There is parking close by – great if you plan to bring a lot of things with you. The Šunj beach on the Island of Lopud is another lovely sandy beach. You don’t have to be staying on the island to enjoy the beach; you can catch a boat ride from one of the neighbouring islands, or from Dubrovnik. The boat takes you to a harbour that is across the island from Šunj, and there are two ways of getting to the beach. Either go on a 20-minute hike or go on a golf buggy ride. For the first 100 meters or so the water is really shallow, so it is perfect for families with small children or people who are not strong swimmers. And then again, it’s going to be underwhelming if you actually love swimming and diving. The sand is dark brown, which is fairly unique for Croatia. The sea is clean and crystal clear, and the water is warm – the perfect beach for people who just want to lay down in the sun and not be bothered by anything. There are lots of sunbeds on the beach, so it might be a challenge to find a spot where you can just put down a towel. Especially if you want to stay close to the sea. Renting a sunbed is always an option, but they are overpriced, especially in high season. Vela Pržina beach is the most popular sandy beach on the Island of Korčula. It is located in Lumbarda, but it’s not exactly in the town area. Luckily, the entire island is fairly small, and everything is pretty close. The beach is just a 20-minute walk away from the post office in Lumbarda, which is at the very centre of the town. Or just a 5-minute drive. This is a long sandy beach, and it tends to get crowded during peak season. However, in the off-season, it’s pretty much deserted – perfect if you want to have some peace and quiet with your friends or family. It is a long sandy beach, but you can also find some large rocks on the sides if you want to lie down and let the waves splash you. There’s a beach bar on those rocks, where you can escape the sun and cool down a bit. And in case you get hungry, there’s also a restaurant just a couple minutes away from the sand. One thing to keep in mind is that the beach is at the southern part of the island, and there’s not a lot of natural shade. You can rent an umbrella or bring your own, and you should definitely do that if want to avoid sunburns. 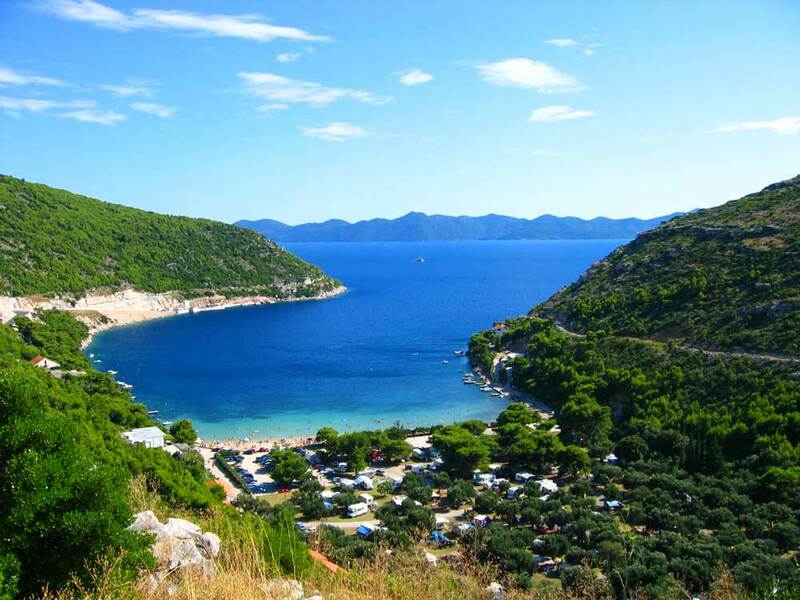 The Pelješac peninsula is home to many stunning beaches, but only a few of them are sandy. 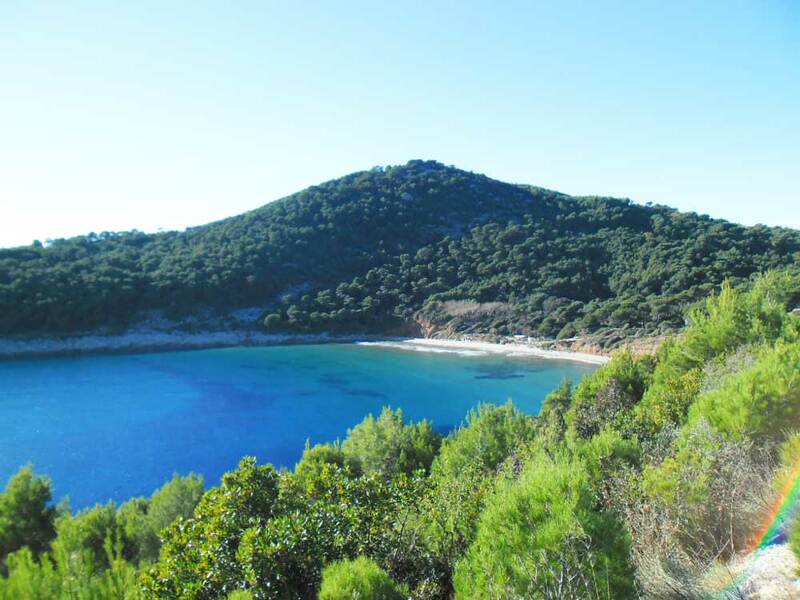 The Prapratno beach is one of them – a long sandy beach, hidden away in a secluded bay that faces the Island of Mljet. The sea is azure and crystal clear; you can see the sand below you no matter how far away you swim. If you’re coming from mainland Croatia, it’s only about 6 kilometres away from Ston, which is at the very entrance to the peninsula. And there is also a ferry that takes you here from the Island of Mljet. But the beach is actually most popular with campers since it is just a few minutes away from the Prapratno auto-camp. 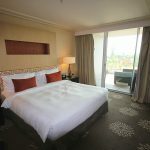 It is the perfect place for a day outing if you don’t want to spend your entire vacation in just one place. The sea is pretty shallow, so it is a great beach for families with small kids. And not to mention all the fun they can have building sandcastles. The pine trees are pretty far away from the water, so you would want to bring your umbrella if you want to have shade from the sun. There’s also a cafe/bar right next to the ferry port if you find yourself pining for a cold beer. Bijeca is the most famous beach in Medulin. 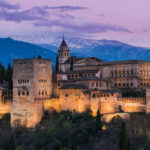 It is more than a kilometre long, and it is located in the Medulin town – if you’re in the area, it will be super easy to find. The entrance to the sea is mild and gradual, so it’s suitable for small children. And with lots of facilities, cafes and bars, it can be fun for the entire family. The beach is mostly sandy, with some gravel and pebbles when you’re in the water. There are pine trees nearby, and you can find a spot in the shade if you don’t want to be in the sun the entire day. There is a floating playground in the sea, which can provide hours of entertainment for your little ones. And if you want to entertain yourself, parasailing and jet-skiing are available options. However, due to the popularity of the beach, it tends to get really crowded during peak season. If you get there early in the morning, you shouldn’t have issues finding a parking spot and renting a sunbed. But get there in early afternoon, and you’ll barely have a spot for your towel. 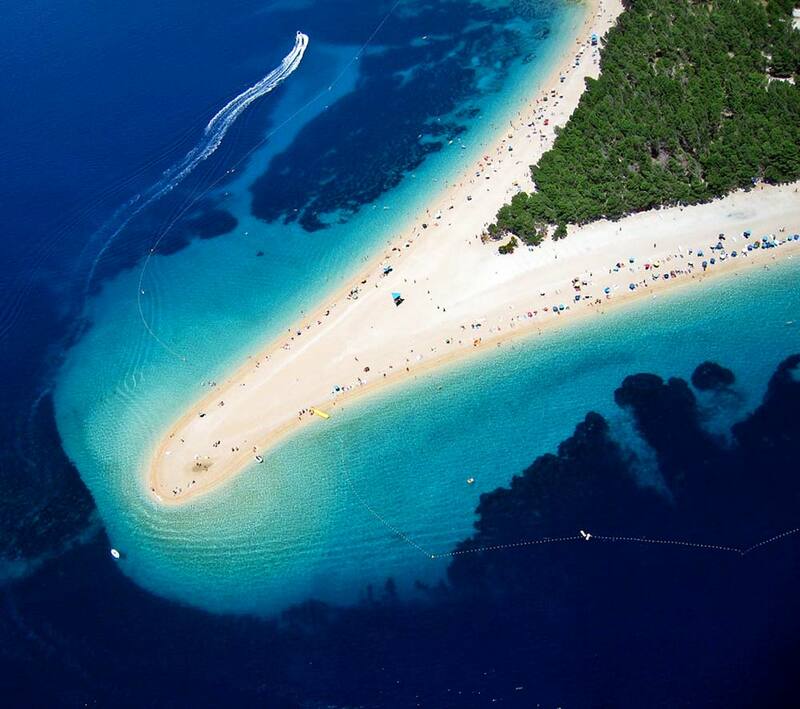 The Golden Horn is perhaps the most famous beach in Croatia. Yacht and plane charters never miss an opportunity to use a stunning aerial photo of this beach in their adverts, for obvious reasons. Because of that, we had to mention this lovely beach, even though it is not entirely a sandy beach. It is a mixture of sand, gravel and pebbles that protrudes about 500 meters into the azure Adriatic sea. Because of the winds and the sea, the shape of the beach changes. Not so much that you will notice it in a day, but enough that over the years it has become obvious. In the very centre of the beach are pine trees that can provide some shelter from the sun and allow you to cool down a bit. Or, if you want to be really close to the water, you can rent a chair and an umbrella. Naturally, there’s a bar on the beach, so there are plenty of cool refreshments coming your way. Just keep in mind that the prices are higher than on most other Croatian beaches. But the environment, the stunning nature and the crystal clear sea make it absolutely worth it. 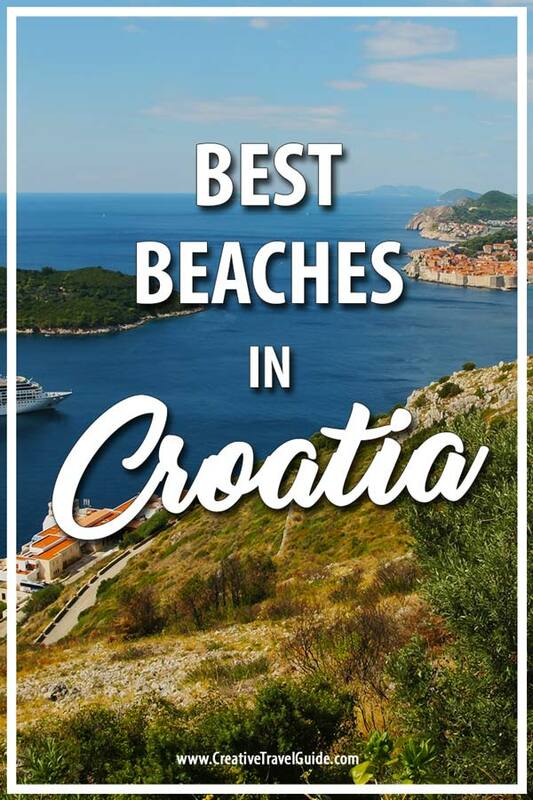 Thank you Anna from Expert World Travel for this insightful guide to the best beaches in Croatia! Which beach are you heading to next?! Love Croatia! We spent a week on Hvar Island and absolutely loved it, water was so clear and clean. Food was insane and the climate was brilliant, not a patch on Aussie beaches but still awesome. Thanks for the beach tips!